Jim Ruddock, William John Adams, -Maxwell, Evelyn Margaret Dugan*, Violet Mary Dugan**, Lou Henderson, James Allen (with stray dog), Harriett Allen, Sonny McClinton, not known , Ena Whiteside, Molly Turkington. ** Violet May Dugan, known as Mamie, dob 21-01-1919 --- died 16-12-1999 aged 80 years. Evelyn and Violet were the daughters of Alexander Dugan and granddaughters of Samuel Dugan, blacksmith of Drumbeg. 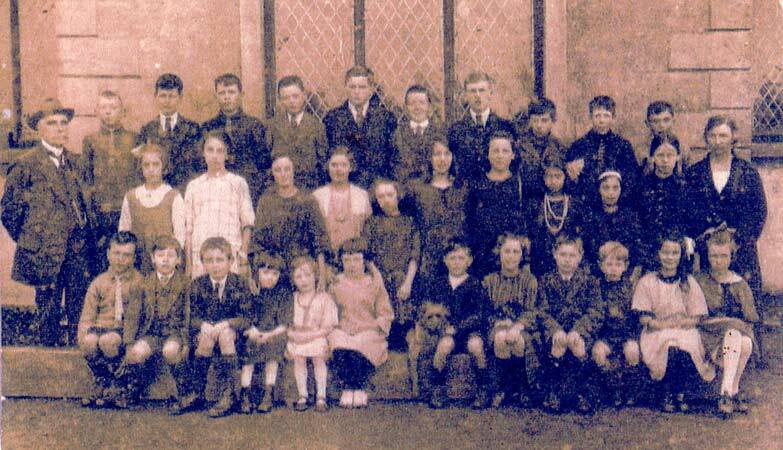 their first cousin Nellie Dugan***, also in the photo, in the middle row, was the daughter of Robert Dugan. Robert Dugan was also a blacksmith and farrier and worked in the Blacksmith's shop with his father Samuel. *Billy Patterson 1918-1982 Lived most of his life in Rhodesia, South Africa. He joined the RAF and went to Rhodesia to train as a pilot but his eyesight was not up to the job.